Every year around the end of October my friend, Rick Loomis, who is he head buffalo of Flying Buffalo, Inc., a small gaming company based in Scottsdale, Arizona (and publisher of my Tunnels and Trolls game) attends the Games and Toys Fair in Essen, Germany. He always brings a few goodies back, so this year, I thought to ask him if he would look for some European Tarzan comics. I showed him what not to get; namely the European translation of American comics, and hoped for the best. Of all my literary heroes, Tarzan is the greatest and oldest. The comic is from 1979. The artist has a style similar to Russ Manning’s Tarzan, but just a little less clean-cut. The book has 48 pages, about double the size of a normal comic, and contains 3 separate, independent stories. The language is Dutch, which may be my favorite European language. Dutch is a cross between English and German, and one can almost read it without help of dictionary, especially if one knows a little German, which I do because I took a year of it in college some 48 years ago. The cover story is called “Ontmoeting met het verleden” which means Encounter with the Past. With Google translation easily available online, I don’t have to guess at the meaning of unfamiliar words like verleden. The great thing about comics is that one can pretty much tell what’s going on even if one doesn’t understand the words. The second story is called De reuze-vogels. Try to guess what it’s about from this page that I scanned. Can you read it? 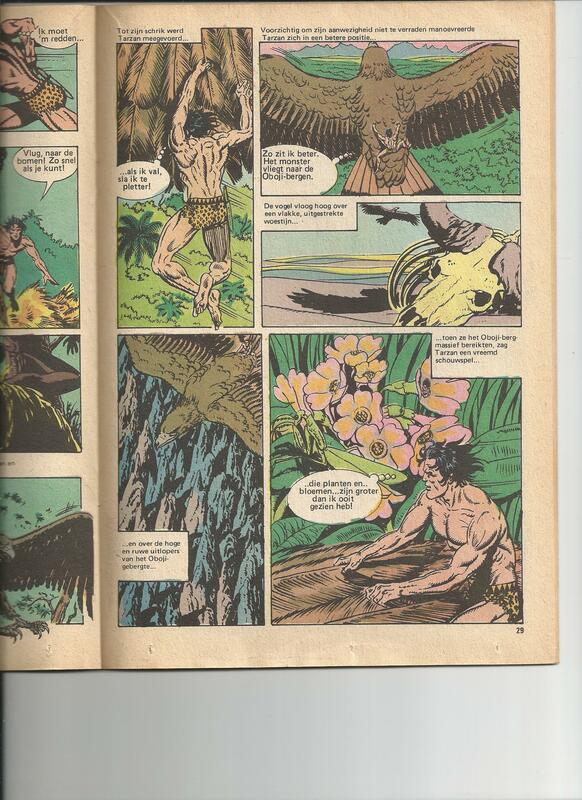 Even without a dictionary I can tell that the last panel says “The plants and flowers are greater (maybe larger) than I have ever seen.” Vogel is clearly eagle in this story–not such a big difference between our english word and the Dutch in this case. I don’t know what reuze means. I’m guessing “giant” or maybe royal. Let’s see what Google tells me. (Ken changes browser windows to check a meaning.) Yes, reuze means giant, and I was right the first time. Grin. It was not a hard deduction to make, but it’s always edifying to be right about such things. And vogel is bird instead of eagle, a fact I sort of vaguely knew, but I wonder why the scripter used that word since they are clearly drawn as eagles. And here’s the back cover. It looks like a preview of the next issue, due in 14 days. Dang! 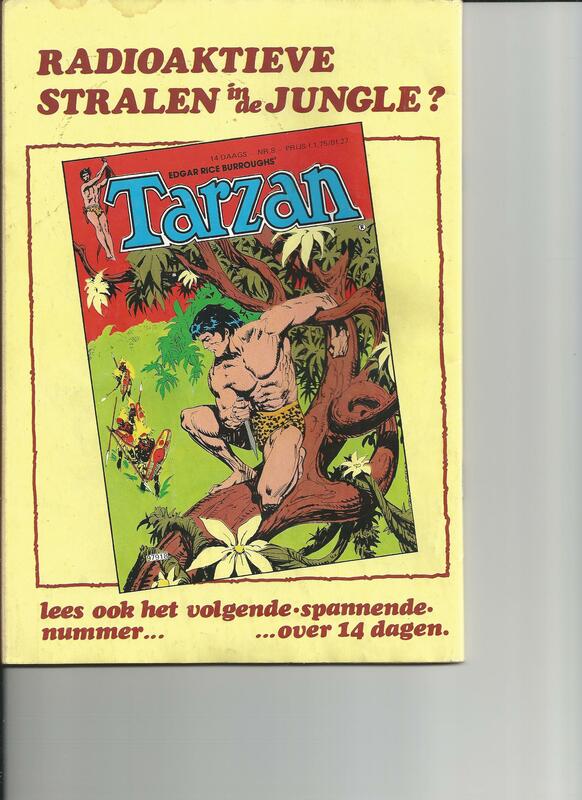 The sixties and seventies must have been a great time for Tarzan fans in the Netherlands, and perhaps all of Europe, with almost 50 pages of new story appearing every two weeks. It says “Radioactive rays in the jungle? Also read the following-exciting number. . . about 14 days. My thanks to Rick Loomis and his host Jan for getting me this minor treasure from the past. I’m definitely enjoying it, and wish I had more. 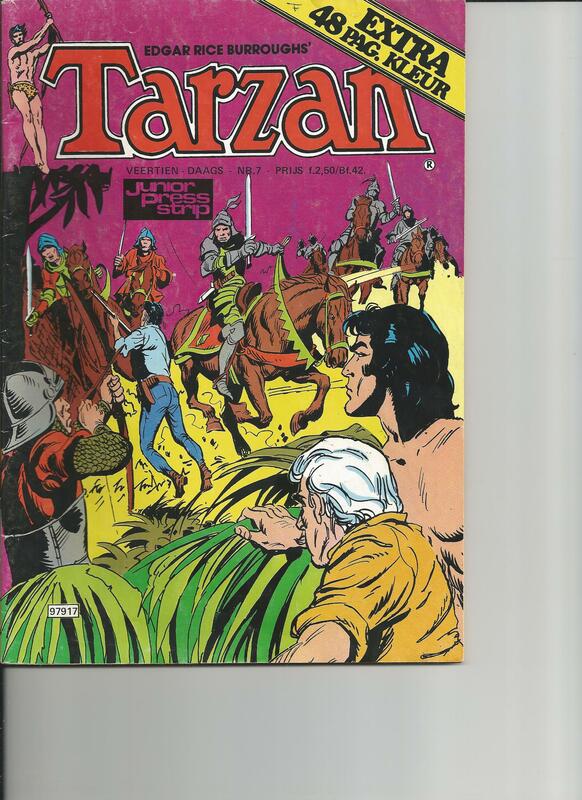 If you have any Tarzan comics (or any other real comics–not just translations of our American stuff) from other countries, why not mention them here? Personally, I think this would be a great way to teach foreign languages–bring on the comics from the countries whose language you want to learn. I’d be happy to see more Tarzan from any other country in the world. The dust jacket for Jane shows her as quite the feral jungle woman herself. Failure of imagination–they could have done better. Amazingly enough, in this internet age of ebooks, audiobooks, netflix, youtube, facebook, and a million other distractions, I still find time to read old-fashioned paper books. I don’t get as many out of the library as I used to–there are perhaps a thousand books just waiting for me to pick them up and really read them in my own home, but when I heard about this book, I did use my Phoenix Public Library to track it down, and I’m glad I did. Jane, the Woman Who Loved Tarzan by Robin Maxwell. New York, Tor, c2012. illus. 320 p. Where did Edgar Rice Burroughs get the story of Tarzan? He claimed that he got it from an unknown man whose name he could not reveal. Robin Maxwell offers us a much more likely source. Burroughs got his story from Jane, and things didn’t happen exactly the way he said they did. There was an expedition to West Central Africa led by Professor Archimedes Porter and his daughter Jane. They did encounter the ape-man and he did abduct Jane and they eventually mated. Tarzan’s father and mother, heirs to the Greystoke title in England were marooned, did build a cabin, and were eventually killed by the great apes. There are other similarities, but things just didn’t happen the way Burroughs told them in TARZAN OF THE APES. First of all, Jane was not a pampered society lady from Baltimore. Instead she was an early feminist–a scientist with training in human and primate anatomy, who thoroughly enjoyed cutting up cadavers to see how they worked. She was smart, fit, and capable. Early in the book she shoots down a charging bull elephant–a gun heavy enough to do that would probably break my shoulder from the recoil, but she did it–oh well. Adrenaline, I guess. After an African expedition led by an unscrupulous villain of a guide, the Porter expedition reached the Ubuntu escarpment (that’s probably a nod to the Weismuller Tarzan movies) and found the Waziri and gold and traces of a lost civilization. Jane got mauled by a leopard and left for dead. Tarzan killed the leopard and nursed her back to health. He taught her how to survive in the jungle. She taught him how to speak English and to read. A healthy young man and a healthy young woman eventually did what healthy young people do when they spend a lot of time together. Tarzan killed Kerchak and was chosen as leader of the Mangani people (posited by Maxwell as a missing link between apes and Neanderthal man–an intelligent species with language and primitive culture not yet in the Stone Age). So, there you have it, Tarzan, King of the Apes. If you ever loved the Tarzan stories, you should read this one. Maxwell handled her topic with finesse, respect, and intelligence. 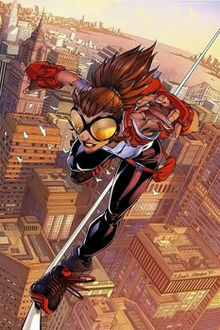 Her focus is on Jane, and Jane really is the protagonist of the book. Highly recommended for all fiction collections in public libraries. Heh! I have about 3 times too many words in that review. I’m out of practice. As a Tarzan fan I’m used to people taking liberties with the Tarzan legend. The movie Tarzan is quite a different creature from Burroughs’ book version. The Disney cartoon Tarzan is different still. 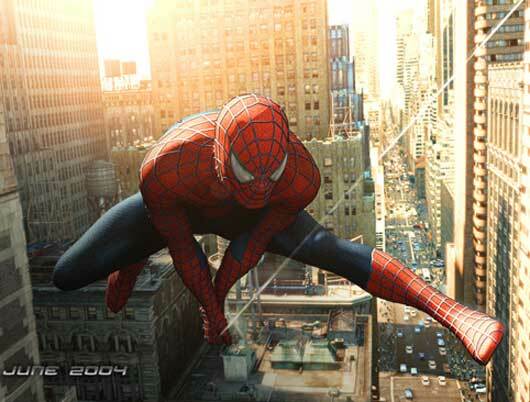 The comic book versions are also different, and there are far more than one comic book version of Tarzan. Then there are all the Tarzan imitations–some of them quite good. 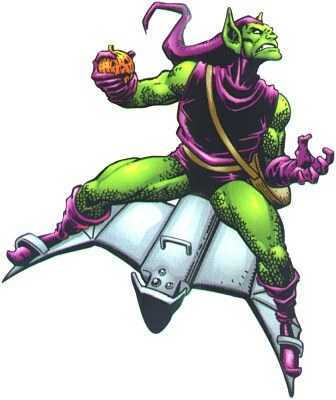 I’ll talk about one, Thun’da, in a future blog. So, I knew I wasn’t going to get the story as Burroughs told it when I picked up the book. And it really isn’t the same story. Maxwell is a modern writer. She didn’t just wander off into her daydreams the way Burroughs did. She has done a ton of research. As a result, although her tale is still fantastic, it seems much more plausible than Burroughs version. (Not truly plausible, mind you, but more plausible). Maxwell’s Tarzan is different from all of them–a bit less superhuman, but still way larger than life. One thing that bothered me a little is that Maxwell crowded things from later in the Tarzan series into the first book, notably the Waziri and a reference to Opar. I don’t want to give away too much about the book. As an adventure novel, it is superb. As a romance novel, and I’ve read quite a few romances just to see what the genre is like, and because some of my author friends write them, it is fair to good. Although the romance is the heart of the story, Maxwell writes more like a biographer than a romance writer. There are the requisite two passion scenes hidden in the last third of the book (as per many romances), but they are tastefully done, and not nearly juicy enough to make this a hot book. Overall, Jane is a fun book, and she’s a fine heroine, and a great role-model for young women. As I get ready to return the book to the library, I’m willing to think of it as the best Tarzan novel of the 21st century. In some ways it is a better novel than TARZAN OF THE APES. In others, it falls short. Burroughs has more action, and his apes are better. Burroughs’ Tarzan is more savage than Maxwell’s. The writing styles are different. But, I really enjoyed reading Jane, and if I weren’t highly impressed by it, I wouldn’t have written this review. If you ever liked Tarzan or Jane, you owe it to yourself to seek out JANE THE WOMAN WHO LOVED TARZAN and read it. Living the fantasy. Robin poses with her own Tarzan. If you’ve read this book, or if you’re a member of the Burroughs Bibliophiles, or if you’ve ever visited the offices of ERB Inc. in Tarzana, California, why not leave a comment? I’ve been a Tarzan fan since I was 10 years old and first heard Johnny Weismuller’s unearthly jungle yodels. If you’re a Tarzan fan, you sort of become a fan of all the other imitation Tarzans, and one of the best imitations was Frank Frazetta’s Thun’da, King of the Congo. 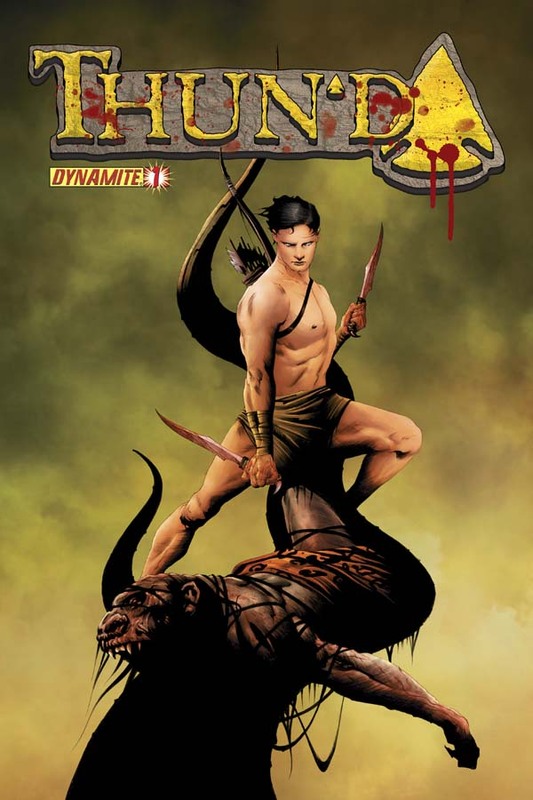 Dynamite Comics retells the story of Thun’da, King of the Lost Land. Gardner Fox and Frank Frazetta created Thun’da in 1952. American aviator Roger Drum crashes in the heart of Africa only to find himself in a place like Burroughs’ Pal-ul-don, a land full of mammoths, saber-toothed tigers, ape-men, and even some left-over dinosaurs. Although fit when he started, the rigorous life of survival in this savage world turned Drum into a paragon of physical perfection. Of course he soon met a beautiful jungle queen, and found himself elevated to the status of jungle god. He got his name from the sound his pistol made when he was slaying a gigantic serpent–the sound of thunder. In August of 2012 Dynamite Comics, re-packagers of every pulp hero they can get their hands on, relaunched the Thund’da comics. 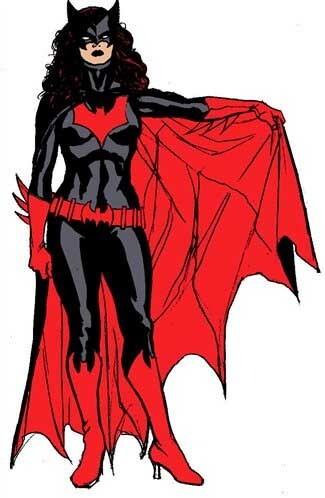 Written by Robert Place Napton with art by Cliff Richards and covers by Jae Lee, they tell the story as if it was happening now instead of the World War II setting originally envisioned by Gardner Fox. 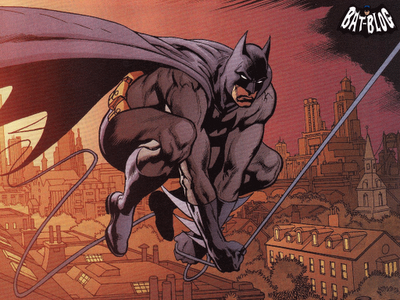 Today’s comics are more gorgeous than those of yesteryear, and move a lot slower. Napton uses 22 pages to start building the character of Thun’da and gets about as far as Fox did in his first 2 pages of story. But, it’s the same story. Dynamite has done something that I really want to praise them for. They reprinted the first 10 page Thun’da story in the back of the book. Although I knew Thun’da existed, I had never actually read any of his stories. The Frazetta artwork of the original is clean and beautiful, and doesn’t waste any time on psychological character development. Roger Drum just naturally adjusts to being a lord of the jungle in the original, slaying ape-men and savage beasts with ease. These covers are all symbolic. Nothing like this happens in the actual comic. The 22 pages of retelling in the second issue gets us through pages 3 and 4 of the original 10-page tale. We can see the ratio now. The modern retelling of Thun’da is ten times as long as the original. This is a nice formula. 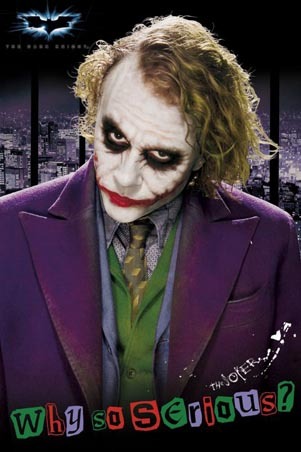 Take some classic pulp story and retell it in the present, but make it ten times as long and detailed as the original. No need to worry about plot–the original tale does the plotting for you. All you as a writer need to do is fill in lots of details that help get from point A to point B in the story. Napton does this extremely well and the comics are just beautiful. Still, it seems a bit wrong to me that I’m paying 30 times as much today as I would have in 1952 for 1/10 of the actual story content. This makes the ratio of money to story an incredible 300 to 1 compared to what a kid could have gotten in 1952. The second issue of the new Thun’da reprints a 7 page story from the 50s. Well, I’m hooked. Cliff Richards’ art is excellent. His monsters and jungle beasts are especially fine. These comics are everything comics should be–well drawn, colorful, and exciting. And the reprints are making me think about finding the Thun’da archive publication that came out in 2010 and buying it. The original Frazetta art is mighty fine in its own right, and nobody was better at pulp adventure storytelling than Gardner Fox. In my not so humble opinion, Dynamite has become the best comic book publisher in the country over the last few years, and they have done it by going back to the classics and retelling stories of high adventure that today’s readers were too young to read when they first came out. I love it. If you like Frank Frazetta, Gardner Fox, Cliff Richards or Robert Napton, feel free to leave a comment. I spent the weekend of August 9-12 in Toronto at the second OSRcon, organized by Chris Cunnington and sponsored (sort of) by Trollhalla member Carter Soles. It’s a small gaming con with an attendance of less than 100 people, but they flew me in and gave me a hotel room to be Guest of Honor, and I was very happy to go. I’ve never been to Toronto before. It’s a lovely megalopolis–a strange mixture of old and new side by side. The old stuff is all bricks and granite; the new stuff is all steel and glass. It was all role-playing gaming. In the two days of the Con, I never saw s single board game or card game being played. I brought a few decks of Magic along, just in case there was nothing to do, and I needed a pickup game, but I don’t think anyone else at the Con even had a deck with them. I brought my camera too, and I took some pictures. The order in which I took the pix is pretty much a chronological record of what I did at the Con. So let me start putting them up. One thing I have to say. Although I don’t take the best pictures, I like the ones I take better than I like the ones taken of me. I kinda hate how old and silly I look. In my mind I’m Harrison Ford. In reality I’m Don Rickles. Sheesh! This is a very poorly organized and constructed blog, but I wanted something online before I head to GenCon for a week. This is the rough first draft of the adventure. I’ll polish it up and make it prettier when I return from GenCon in a week or so. Some people say, if a thing is worth doing, it’s worth doing well. Talking about this blog, I say, like Nike, Just Do It. This one isn’t done well, but it’s here as a record of my travels and good times. Ken St. Andre is no perfectionist. 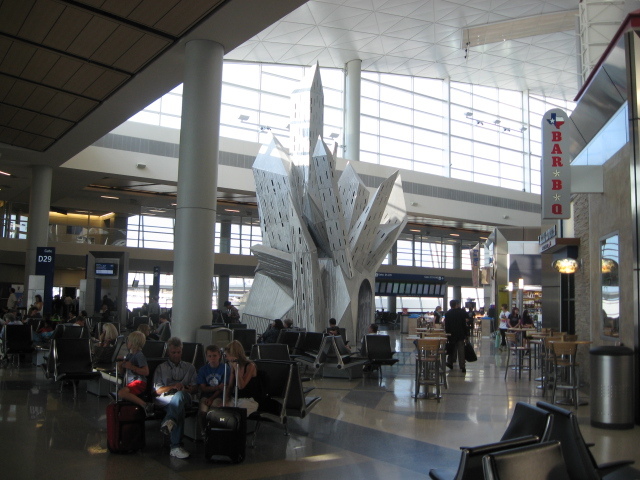 I’m in a food court at Dallas/Fort Worth International Airport on my way to Toronto. I had to spend several hours there between flights. The architecture was bizarre. 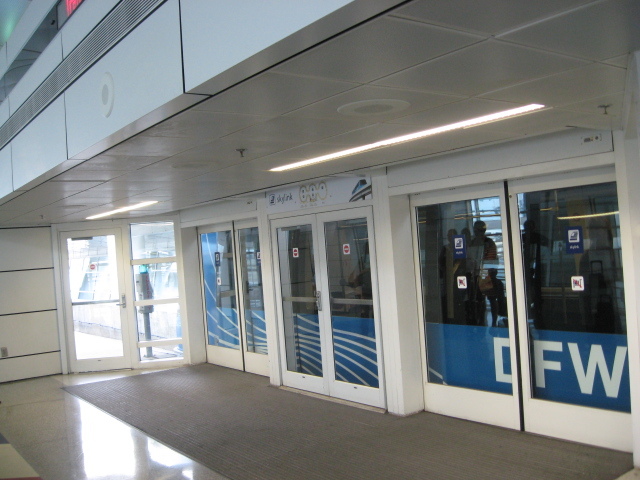 Dallas is so big that you have to ride a train between terminals. 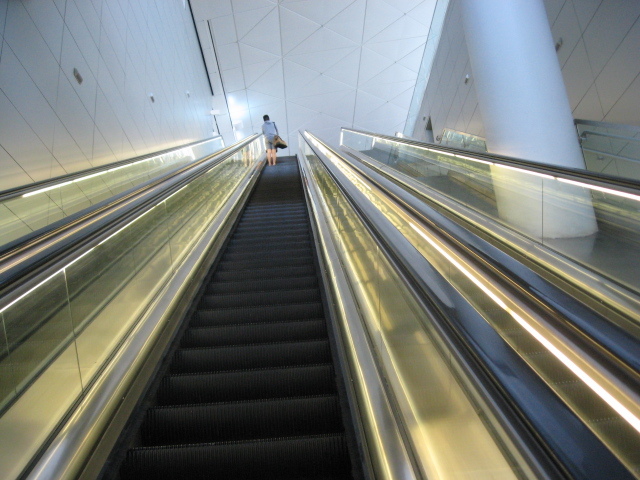 The escalators are huge at Dallas. I spent a lot of time on this trip looking up. Here’s a shot of that train I was talking about. My flight was late. 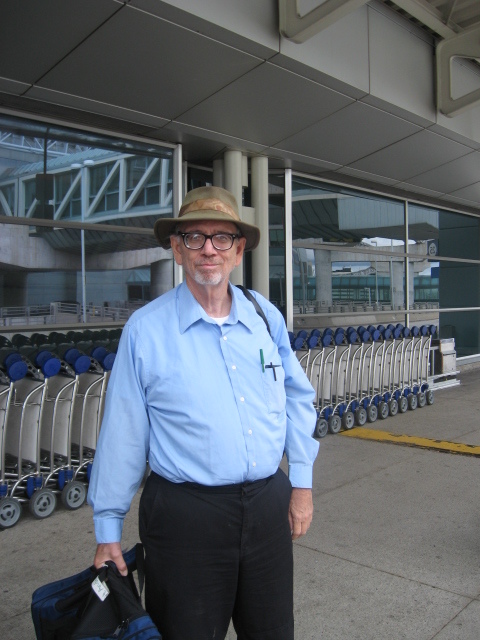 Here I’m in Toronto. These three came and got me at the airport. 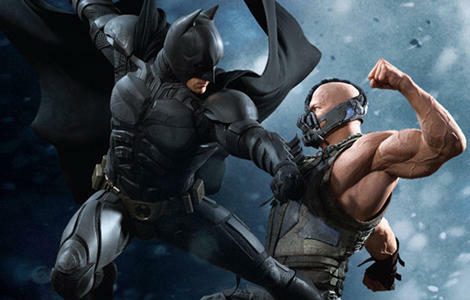 From left to right: Brendan, Chris, Carter. To meet them I think I had to walk a mile through the airport from where the plane landed, and go through Customs, all at 2 o’clock in the morning. Such are the adventures of my life. Friday morning, I walked past this bizarre building. 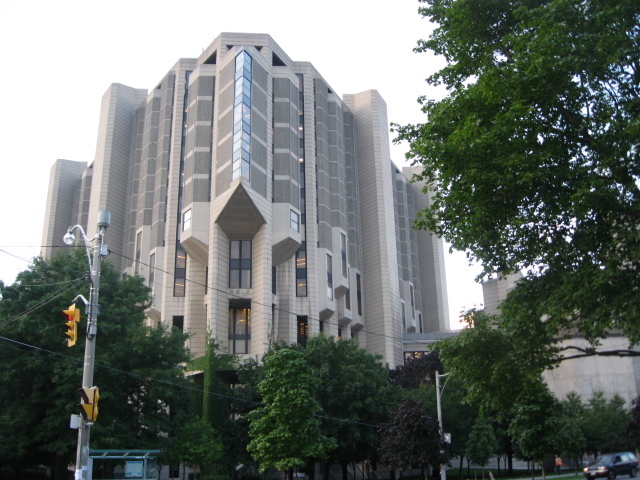 It is the Robarts Library of the University of Toronto. My path to the Con from my hotel took me right through the heart of the campus. 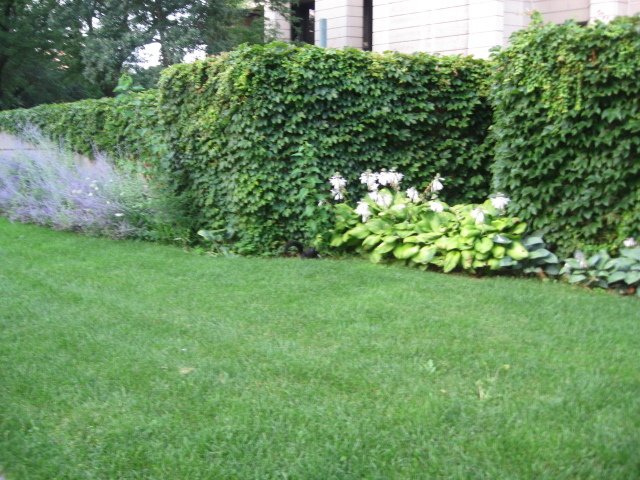 The little black thing in the center of the photo is one of the evil black squirrels of Toronto. It was the most ferocious wildlife I saw (not counting Man) on this trip. 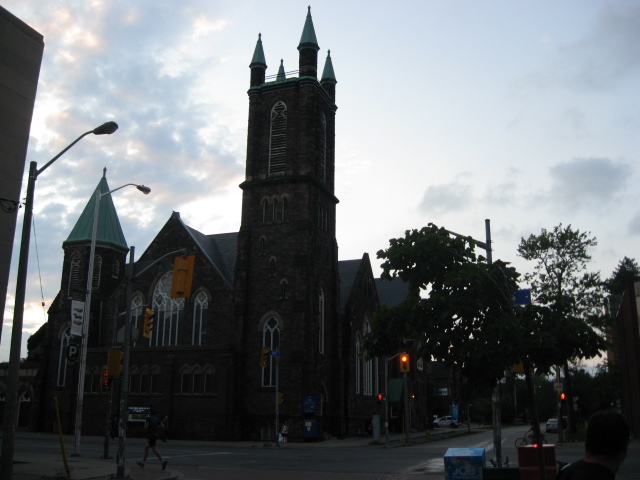 Toronto seems to be full of these ancient Gothic towers. I took this shot at sunset walking back to the hotel. Should have gotten more pix from Friday, but my batteries were dying. 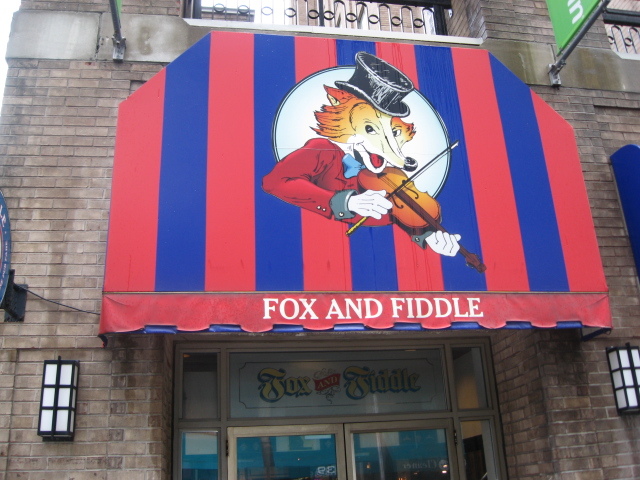 I ate most of my meals at the Fox and Fiddle restaurant and bar. It’s a very lively place inside at night–the karaoke there is excruciating. 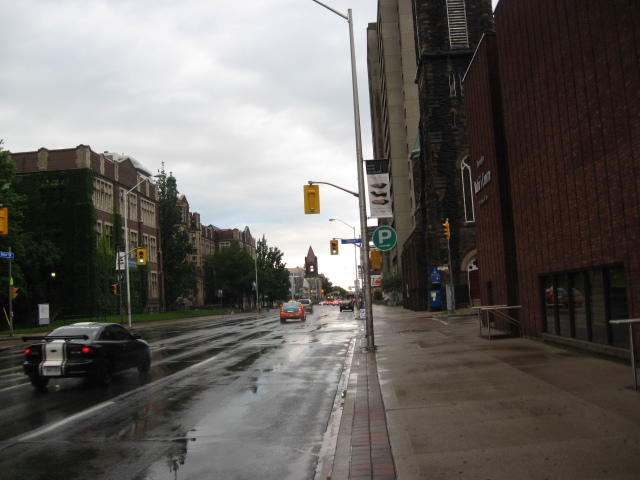 Looking down Bloor Street on a wet Saturday morning. I managed to get more batteries for my camers. Thanks, Brendan! 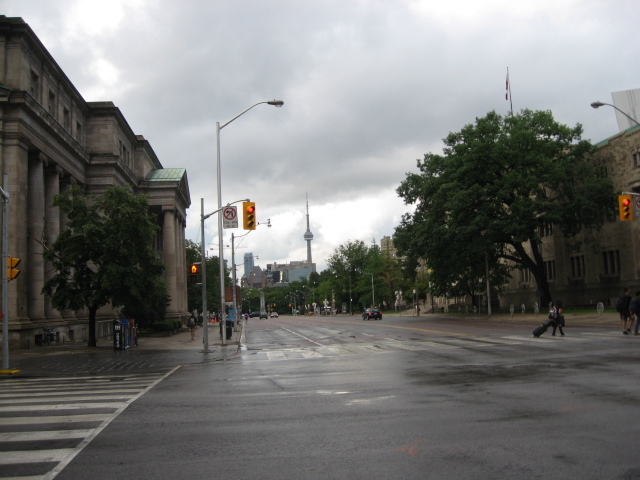 Looking the other way on Bloor Street. 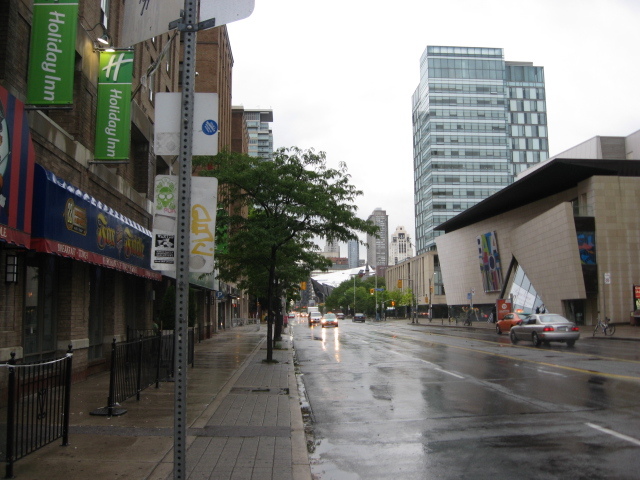 It rained a lot in Toronto while I was there. I didn’t care. I was having a ball. 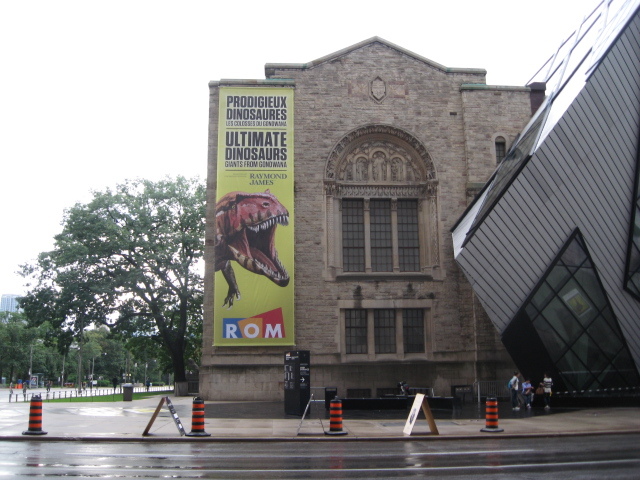 The strangest building on Bloor Street–the Royal Ontario Museum (the Rom). I thought it looked like Superman’s Fortress of Solitude. 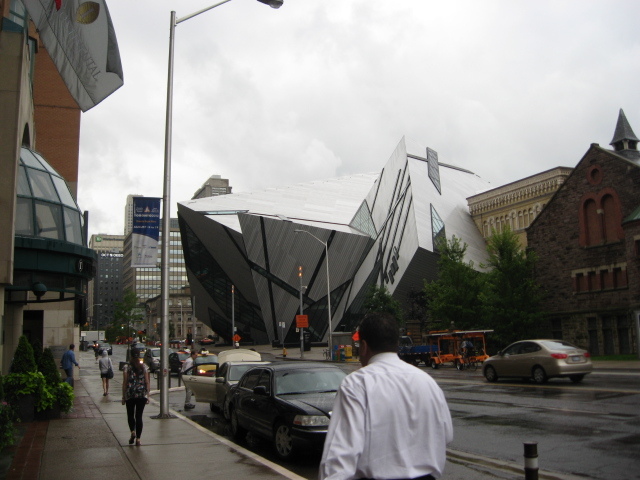 The angular part of the museum was a post-modern addition to the original grey brick construction. 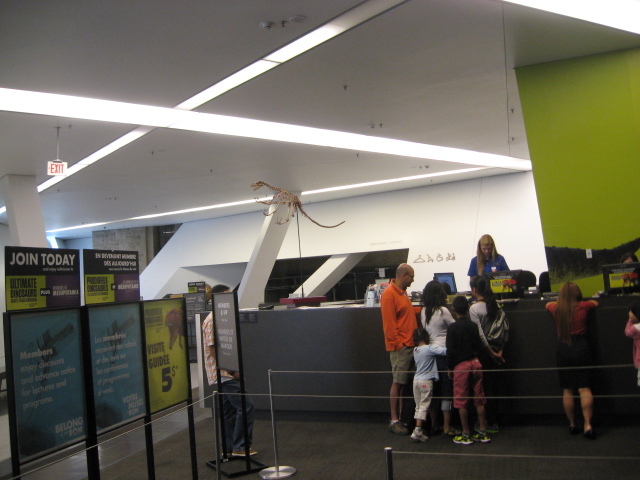 Apparently the main attraction inside was Dinosaurs. That’s the C.N. Tower in the distance. It’s the Canadian version of the Space Needle. I saw it a bit closer while heading to the airport on Sunday. Very tall. Revolving restaurant. 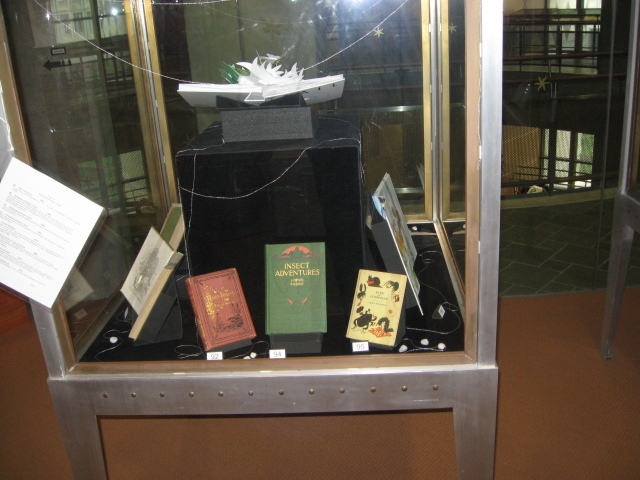 The very first Tarzan illustration–under glass–on display at the Merrill Collection at the library. I have been a life-long Burroughs fan, and it was a pure treat to see all the ERBiana they have (I didn’t see anywhere near all of it.) at the library that hosted the convention. 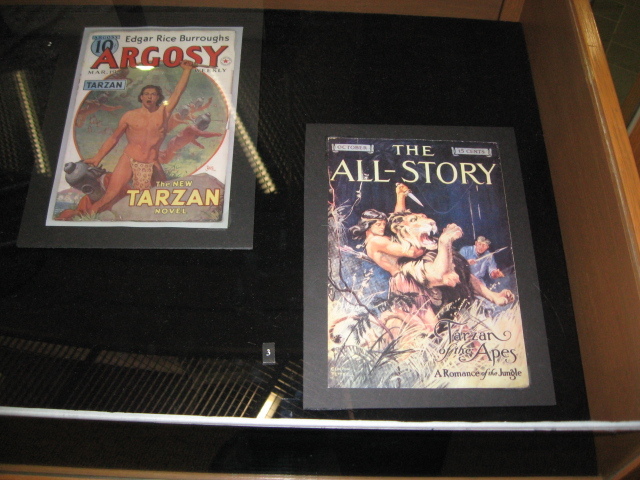 The library was doing a display of Edgar Rice Burroughs material when I arrived–almost all Tarzan. They had pulp magazines in a display case. 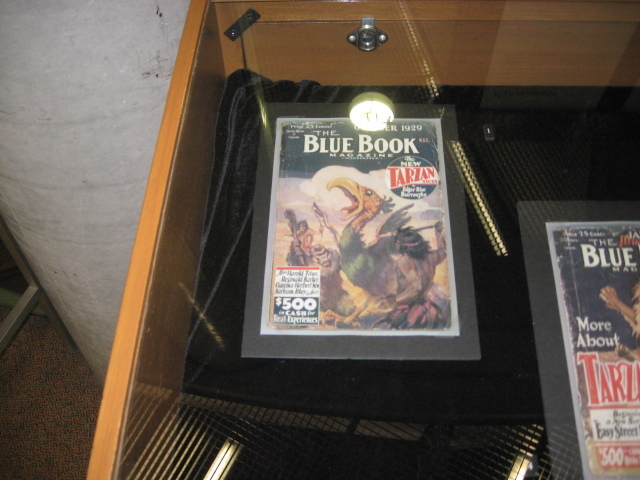 This Blue Book is from Tarzan the Untamed where he’s in Pal-Ul-Don. It appears that I didn’t actually photograph much of the gaming convention itself. I was far more interested in the library and the displays they had upstairs. Really, I did spend most of 2 days in the dungeon playing games, but when the camera came out, it was books and bizarre sights I chose to photograph. Other photographers were there, and perhaps I can insert some of their pix into my own. Big little books featuring Tarzan of the Apes. 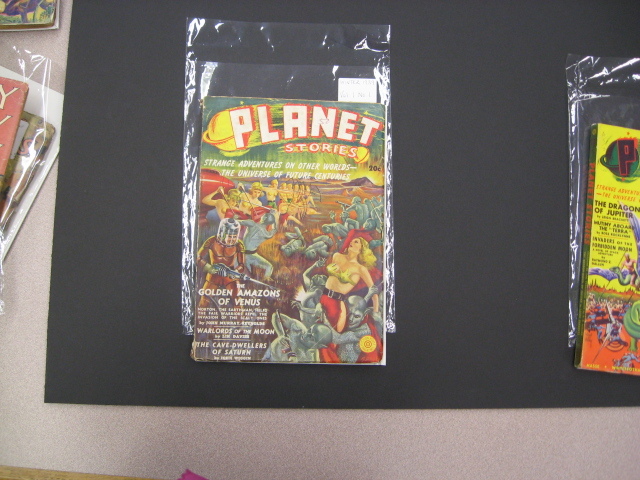 My favorite pulp magazine of all time was Planet Stories. I used to own some of them. This is Planet #1–Golden Amazons of Mars. What were they thinking? The Dragon Queen of Jupiter, a Leigh Brackett story I’d never heard of before. Oh, I so wanted to take the mag out of its cellophane wrapper and read those old stories. 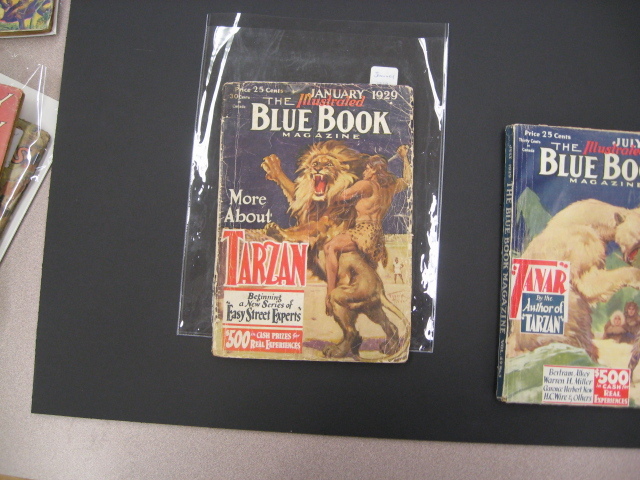 Tarzan in Blue Book magazine. and Tanar of the Earth’s Core. 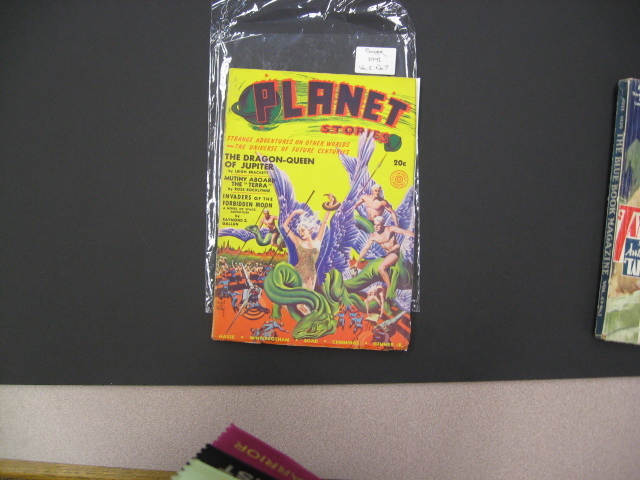 I love pulp science fiction magazines, and I got to see some great old covers in the Merrill collection. 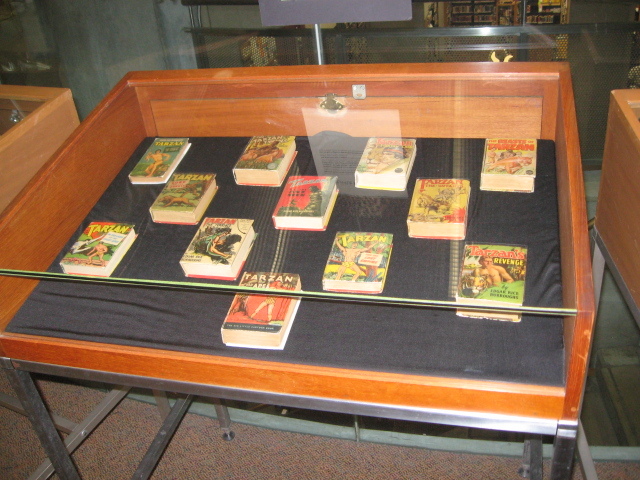 First editions on display in the Osborne collection of the Toronto Public Library. The theme was insects in Children’s Literature. Painted walls of Toronto. 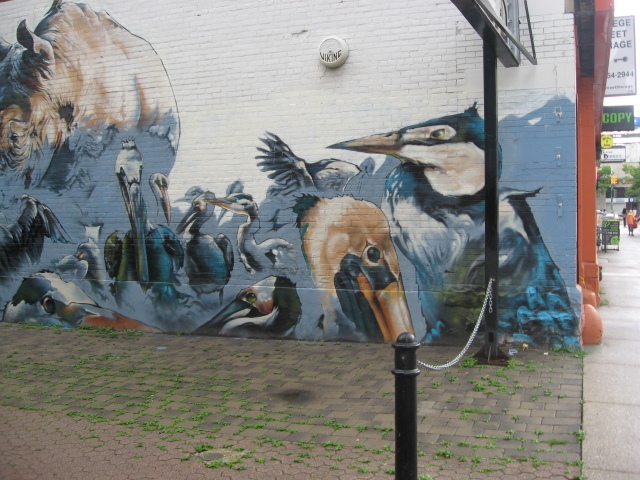 I don’t have any idea why this magnificient scene of birds and a rhino was on the wall of a cheap diner not far from the library. 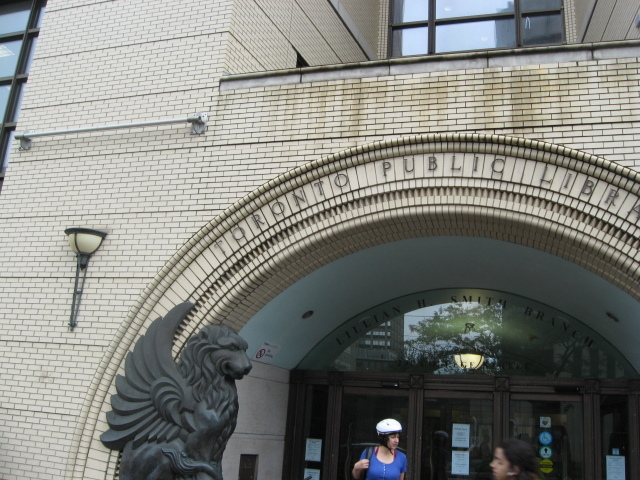 Griffin-guarded entrance to the Toronto Public Library where the Con was held on Saturday around 2 p.m.
From the edge of the lobby, you can just see the skeleton of a gigantic dinosaur. The head is at the left. 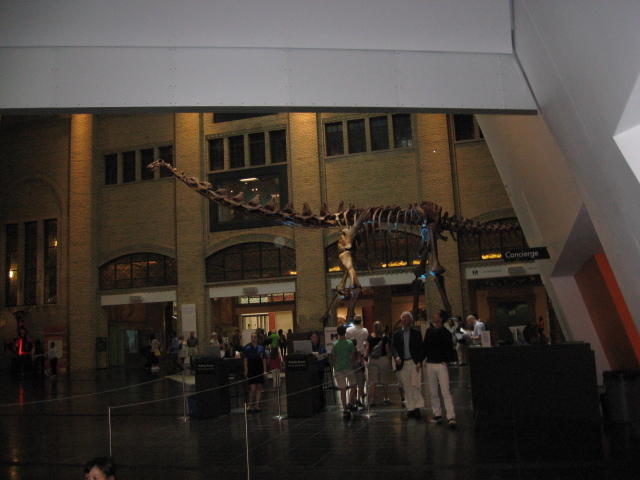 Looking into the museum. Top right corner is dinosaur neck and head. I was trying to photograph something smaller and bizarre in the center but people walked into the path of my photo. Grrrr! It’s what happens when you’re too far away from the target. 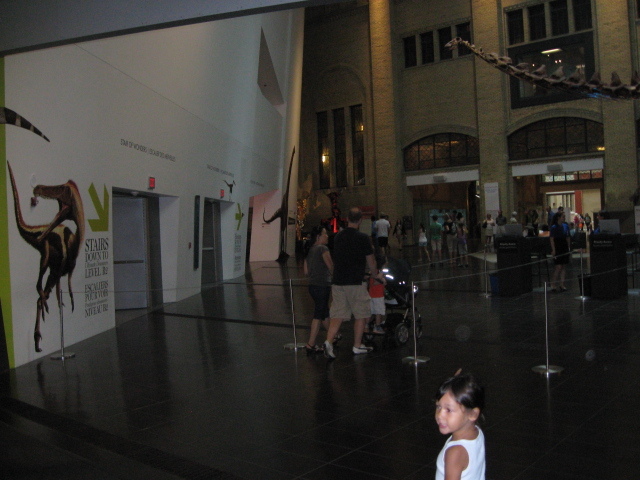 I got into the lobby of the ROM. This little dinosaur skeleton was there to greet me, or perhaps to eat me. 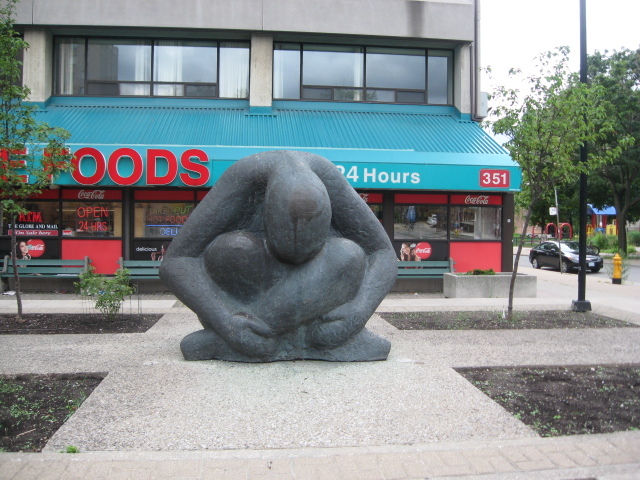 On Sunday morning I found a troll–a great black stone troll on the street across from my hotel. He was apparentlhy sad to see me go. 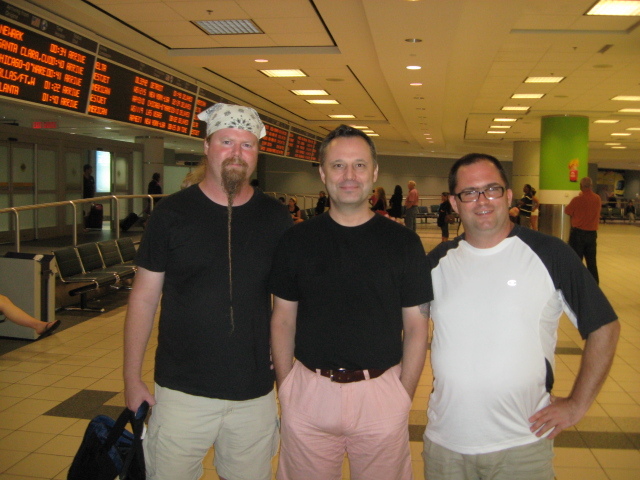 Here I am at the Toronto airport saying goodbye to my friends Carter & Brendan. My bags are on my shoulder and in my hand, and there are 9 hours of air travel ahead of me. My adventures weren’t quite over. The airport was confusing, and I wound up at the wrong gate, and after hours of waiting I hear an intercom announcement that’s last call for my flight at a different gate. I have shoes off and coins on the ground as I was figuring out what to do with my Canadian change. I gathered my things and ran through the airport, shoes untied, bags half open and made it to my gate, last person to board. On the run, the battery of my phone jounced out and so did a paperback book and sci-fi magazine. They found the reading material, and I got it back on the plane, but the battery was lost. Oh well. One pays for one’s pleasures, and it was a small price–that along with a sore backside from 6 hours in a plane and another 3 waiting in airports–for the most fun weekend I’ve had in years. If you’ve ever been to Toronto or attended a really small gaming convention that was all role-playing, go ahead and leave a message? I’ve been a Tarzan fan since I saw my first Johnny Weismuller movie as a kid, and that was more than 55 years ago. I’m not the greatest Tarzan fan. I’m not a member of the Burroughs Bibliophiles or anything like that, but I have seen every movie I could, read all the books, collected the comics to some extent. So I was pleased when Dynamite Entertainment–a comic book publishing company decided to redo the original Tarzan stories in comic book form. They could do this because those books are in the public domain–Burroughs has been dead since 1950, and his copyright goes back to 1912. And now the tale is being told once more, superbly illustrated by Roberto Castro, and scripted by Arvid Nelson. Nelson must be quite a Burroughs fan, or else he has decided to hitch his star to the Burroughs legacy, because for a little more than a year now he has also been doing an adaptation of Burroughs John Carter of Mars series. Dynamite does an interesting and good thing, in my humble opinion. They bring out the first issue of new titles at a very affordable $1 price, and they do multiple covers, with the rarer ones commanding collectible prices like 7.99 and 9.99. I kind of think the collectible covers are a bit of a rip, and I won’t pay $9.99 to have a negative version of a cover, but I guess some people will. 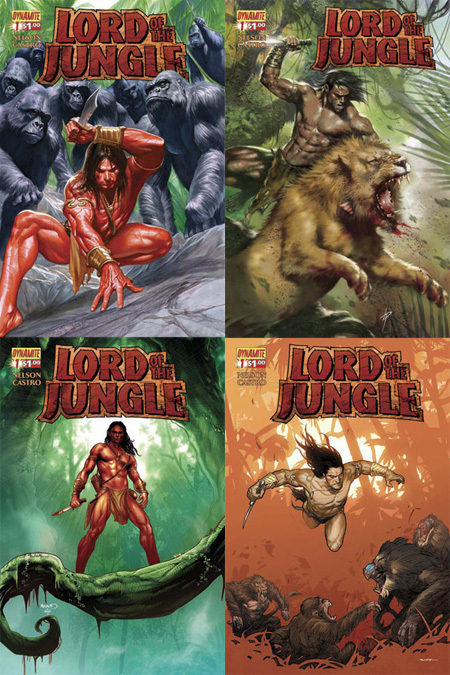 The four covers for Lord of the Jungle #1 in January 2012. Here’s a bit of an oddity. 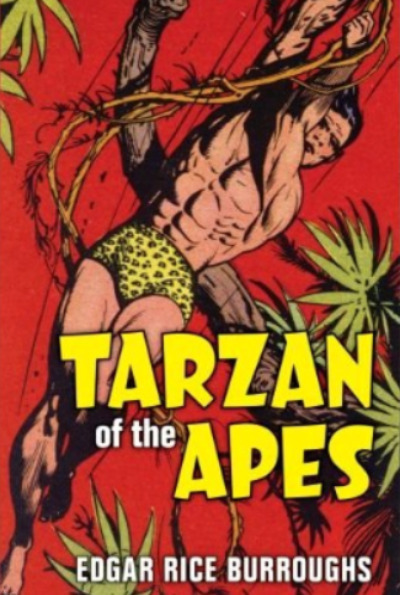 The comic could not be called Tarzan, so they used Lord of the Jungle instead. Burroughs used that title for one of his novels, but I don’t think ERB Inc. trademarked that phrase the way they trademarked Tarzan of the Apes. 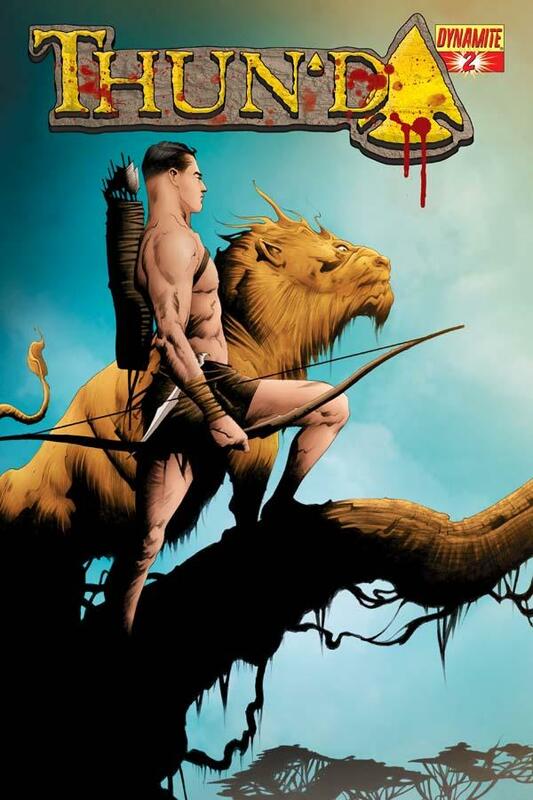 We might have a Tarzan comic in which the word Tarzan never appears. I’ll be interested to see how that works out. 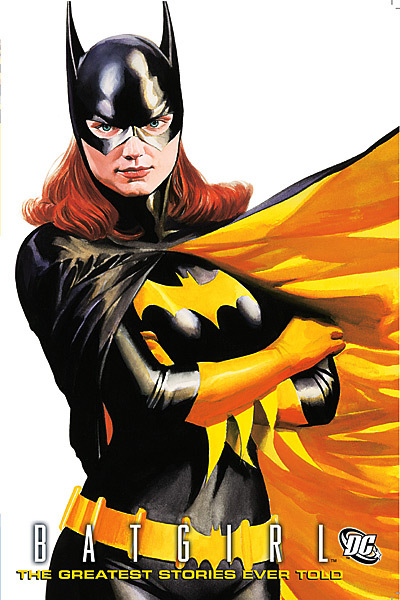 The four covers are by Alex Ross, Ryan Sook, Paul Renaud, and Lucio Parrillo. Ross is the only one I’ve ever heard of before, but all four artists are masters of their art. Arvid Nelson has done an excellent adaptation of Tarzan of the Apes, and I will be buying this book as long as it comes out. I can only hope that it wanders off and breaks new ground with original stories the same way his Barsoomian books have. They deserve a blog, too. Dynamite Comics has somehow stumbled into a slightly different way of doing comics. 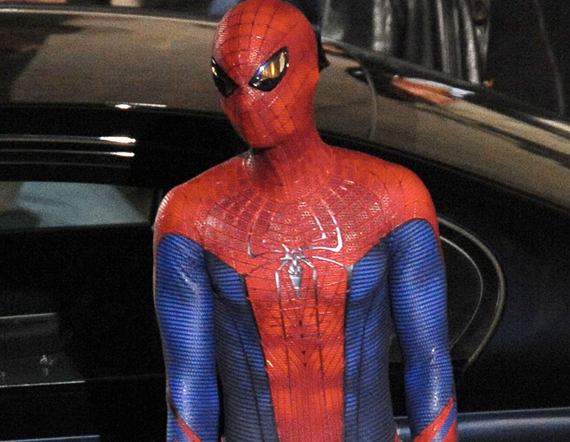 Instead of maintaining one consistent superhero universe in the style of D.C. and Marvel, they are simply doing popular characters of the past–legendary characters including the Lone Ranger, Zorro, the Green Hornet, Flash Gordon, Vampirella, Red Sonja, Sherlock Holmes and many, many more. Their art is always clean and realistic–their women are indescribably beautiful–their male heroes are classically heroic. 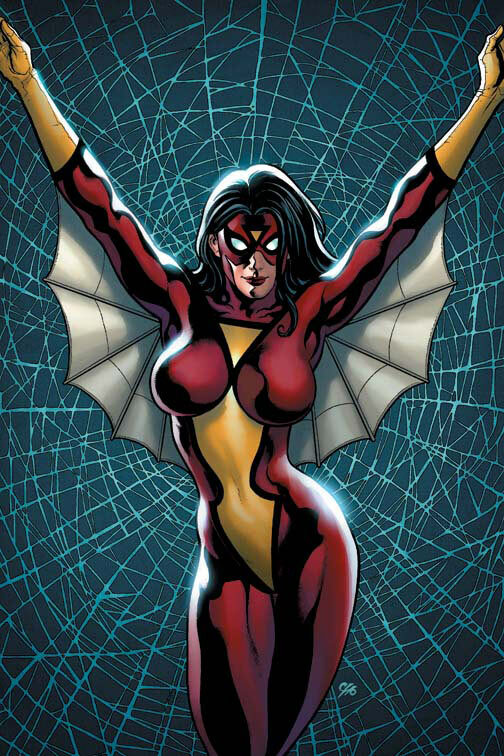 Dynamite pushes the envelope of sexiness and great storytelling with almost every issue. I didn’t realize how many titles they publish until I started to do a little research for this blog. As a comics fan I’ve always loved the stuff from D.C. and Marvel and Dark Horse, but the company producing, imho, the very best adventures in comics today is Dynamite. If you’re a comics reader, they have something for you also. Comics fans and Tarzan fans are invited to make comments here. Do you like the Dynamite books? If so, which ones are your favorites? And why?